Luton Town boss Nathan Jones has made his first move of transfer deadline day to sign defender Lloyd Jones from Liverpool for an undisclosed fee. The 22-year-old has moved to Kenilworth Road on a two-and-a-half year contract and goes straight into the squad for this weekend’s home match against Exeter City. He’s come from Liverpool and I know the coaching he gets there, and that was a big factor in us taking him for longer. Jones started out in the academy at his hometown club Plymouth Argyle, before Liverpool paid a reported six-figure fee to take him to Anfield in 2011. During his seven years with the Reds, the defender has been a regular with the U21s and U23s and was included in the first-team squad on the final day of the 2012-13 season, although never made a senior appearance. He has won international caps for both Wales and England at youth level up to U20s and spent time on loan at Cheltenham Town, Accrington Stanley, Blackpool and then Swindon last season, where he featured 29 times, scoring twice. 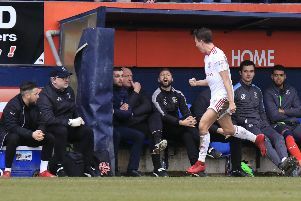 Returning to Anfield, Jones has made 12 appearance for the U23s this season as on his signing, the Luton boss said: “We were looking to bring some defensive cover in for the short-term with Scottie Cuthbert being out and Johnny Mullins picking up an injury, but when Lloyd became available, he’s one that we’d earmarked as being able to take forward longer term. “He’s young enough that we can improve him and develop. He’s got good pedigree and has had some good loans already, and he’s one we believe can progress with the club. “Technically he’s very good. He’s a great size, so now we’ve just got to make him a Luton player. “He’s been out in League One and League Two already, so he’s not untried. He’s come from Liverpool and I know the coaching he gets there, and that was a big factor in us taking him for longer.